Selenicereus grandiflorus is a cactus species originating from the Antilles, Mexico and Central America. The species is commonly referred to as queen of the night, night-blooming cereus (though these two terms are also used for other species), large-flowered cactus, sweet-scented cactus or vanilla cactus. 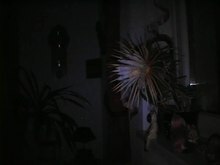 The true species is extremely rare in cultivation. Most of the plants under this name belong to other species or hybrids. It is often confused with the genus Epiphyllum. Cereus donkelaarii Salm-Dyck Allg. Gartenz. xiii. Spanish: Reina de las Flores, Reina Gigante, Cardon, Gigante, Organillo, Reina de la noche. Grandiflorus (Lat.) = large flowered. 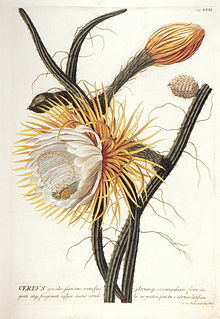 When Carl von Linné descripted this cacti in 1753 it was the largest flowered species of cacti known. Paradoxically, are moderate in size compared with several other Selenicereus species. The first species to be brought into cultivation. Linné (Linnaeus) descripted it in 1753, but it was known long before. Records from Hortus Kewensis gives that the species was grown at Royal Gardens at Hampton Court before 1700. There has been doubt about which plant was available to Linné when he drew up his description, but this is solved and both the plates on this side show the authentic species. Greater Antilles (Cuba, Cayman Islands, Puerto Rico, Jamaica & Haiti), Mexico, Guatemala, Belize, Honduras, Nicaragua, and a few other locations in South and Central America. Climbing on trees and on rocks at 700 metre altitude. Extremely variable, especially in Jamaica, stems with slightly wavy to strongly knobby margins occurs in the same plant. Much confused in cultivation. Many species of Selenicereus should be reduced to synonyms of subspecies of this species, differing merely in degree rather than in kind. An easily cultivated, fast growing epiphyte or lithophytic plant. Needs a compost containing plenty of humus and sufficient moisture in summer. Should not be kept under 5 °C (41 °F) in winter. Perform best if grown in full sun. Extra light in the early spring will stimulate budding. Flowers in late spring or early summer, only blooms one night a year for several years and withers within hours. Selenicereus ×callianthus (Gaillard) Lindinger (1942). This is a hybrid between this species and Selenicereus pteranthus. Many plants under the name Selenicereus grandiflorus may belong to this cross. It is very similar to Selenicereus pteranthus, but stems more slender and spines, longer and yellowish. Wikimedia Commons has media related to Selenicereus grandiflorus. ^ "Selenicereus grandiflorus". Natural Resources Conservation Service PLANTS Database. USDA. Retrieved 9 November 2015.